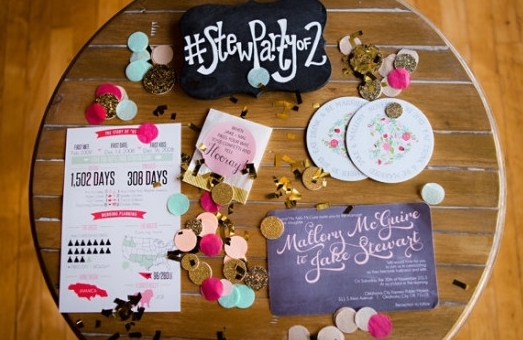 Wedding hashtags can be tons of fun for the newlyweds but only if the guests join in on the fun, too. The couple definitely wants you to use their hashtag, but it’s not a good idea to go completely crazy. Keep these six rules in mind before you post your Insta. Maybe this is obvious advice, but it’s worth saying. Using a big day hashtag on a photo means that LOTS of people will see it, including the newlywed’s family, friends, and even colleagues who aren’t at the wedding. You’re totally welcome to be fun and silly, but keep all clothes on and don’t say anything you wouldn’t want the bride’s grandma to see. 2. Don’t post when drunk. If you had a few beverages from the open bar, your judgement of what’s appropriate might be skewed. As the night goes on, keep taking fun photos — just save the sharing till morning. You’ll save yourself and your friends some embarrassment. 3. Only post “I do”-related pictures. Wedding hashtags let the couple curate all kinds of moments from their wedding weekend in one place. A random photo of a puppy you saw on your way to the venue just won’t fit in. But, a shot of you and your date at the venue, a picture of the bride during the reception or a drool-worthy snap of the dessert table are all fair game. 4. Post the photos within a few days. Chances are the newlyweds will be scrolling through the hashtag feed within a day or two of the wedding. If you don’t want to post photos on the night of the bash, try your best to get the pics up the next day so that everyone sees your snapshots. 5. Use the RIGHT hashtag. Nothing is as disappointing as putting a typo in the hashtag so the couple never sees it. Double check that the tag you’re using is right to make sure your photo isn’t forgotten. 6. Use it on any platform. Instagram is the go-to, but of course, hashtags work on Facebook and Twitter, too! The couple will be psyched to see their special tag used all across the Internet. Read more wedding guest advice on Lover.ly!